Another page wherein I lament not being able to draw faster. The colouring was less than two hours, the lineart took like a whole day. Bahhh. Still, I think I’m hitting a good style for the lineart that compliments the colouring, or at least makes it easier. I always liked the fineline inked look with cel-shading, but couldn’t be bothered inking that carefully. What I’m doing right now is inking somewhat sloppy fine lines on top of a greyscale sketch, and keeping it all in the final piece, so I get some extra shading in there to boot. I think I’m not making any sense, so have a slapdash step by step sort of thing. If I were smart this would have been a vote incentive, but I cannae be bothered right now. 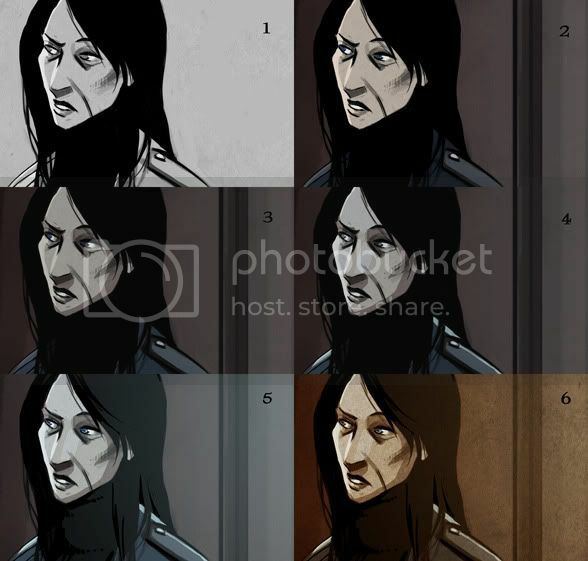 It basically goes 1) Lineart/greyscale tones, 2) flat colours, rubbish background, 3) tint highlights blue, shadows red, 4) add some hard blue light, 5) gradient with some shadows cut out, then 6) final colour adjustment, texture. wow, I’m really entertained by your process. So many people do work the rendered grayscale to color method and it turns out so nice… Someday I’d like to try it. I don’t know how or if this page was done any different from how you normally do them, but damn; that looks REALLY good! Thanks! I think it’s because I’ve introduced more fine linework into my process starting with page 136, and it’s really just started to work on this page. Something about the colour scheme here seems to have made the lines pop a bit more than usual. I just finished reading the archives, and this comic is great. Keep up the good work. I love your art, it’s some of the best I’ve seen in a webcomic. Thank you, glad you’re enjoying it! Normally I just like to sit in gob-smacked awe & just soak in how much I enjoy your webcomic, especially the expressions, everything else is good, but the expressions are amazing, but perhaps you could explain something to me. Panel 4 (of 5) looks to me as if the light is coming from the left (strong light lines on the face) passing the character to the right thus explaining the wall lighting behind the character (lighter on the right, darkening to the left), but the light reflection on the jacket (especially the character’s left shoulder) seems to indicate that the light might be coming from behind the character. Is there perhaps a reflective surface in the room that we cannot see or is that another light source coming from down the corridor the two are just exiting.